British Columbia has the greatest diversity of bats in Canada! Sixteen species of bats live in BC and 10 of them call the south coast home. The Big Brown Bat is a relatively large bat that ranges from 98-131 mm in length and typically weighs ranges between 12 g and 22 g. They have a large, broad head, broad nose, and long, lax fur. Its fur color varies from pale to dark brown. Its flight membranes and ears are black. The ears just reach the nose when pushed forward; the tragus is short and blunt. The calcar has a prominent keel. The skull is robust, with thick, heavy jaws, a flattened brain-case, and large teeth. The Big Brown bat is known to have a strong affinity for buildings and it is often referred to as a house bat or barn bat. In British Columbia, maternity colonies have been found in the attics of houses, cabins, and barns. Maternity colonies of Big Brown Bats as large as 700 individuals have been reported, but those associated with buildings in British Columbia are small, comprising no more than 50. This species emerges around dusk to feed. It is regarded as a generalist that hunts in a variety of situations: over water, over forest canopies, along roads, in clearings, and in urban areas, often around street lights that attract insects. The Big Brown Bat makes several feeding flights during the night, each 30 to 60 minutes in duration. Between flights, it usually roosts near the feeding area. The Big Brown Bat inhabits a variety of habitats in the province, including arid grassland and interior and coastal forests. It ranges in elevation from sea level to 1070 metres. The Big Brown Bat has a vast range that extends from northern South America to southern Canada. In British Columbia, it is found on Vancouver Island, the coastal mainland north to the Bella Coola River Valley and the interior where its northern limits are unknown. Northernmost localities in the province are from the Prince George and the Peace River region, but because there is a record from the interior of Alaska, the range may extend into extreme northern British Columbia. The range of the California Myotis extends from southern Mexico to British Columbia and southeastern Alaska. In British Columbia, it inhabits several coastal islands including Vancouver Island and the Queen Charlotte Islands, the coastal mainland north to the Bella Coola Valley, and the interior north to Wells Gray Provincial Park and east to Kootenay National Park. In British Columbia, this species inhabits arid grasslands, humid coastal forests and montane forests. Its ranges in elevation from sea level on the coast to 1280 m in Glacier National Park. The Hoary Bat is the largest bat in British Columbia with a total length between 125-144 mm and a weight between 20-38 g. They are distinctive because of their striking hoary colour which it takes its name from. The long, soft fur on its back is a mix of dark brown and grey hairs that are tinged with white. There are small patches of yellow or white on its shoulders and wrists. Yellow fur also appears on the throat, around the ears and on the underside of the wing membranes. The wing membranes are dark brown with paler areas on the forearm and fingers. The ears are round and short with a short, broad tragus. The dorsal surface of the tail membrane is densely furred; the hind foot is relatively small with a heavy covering of fur on the upper surface. The calcar has a narrow keel. Because of its tendency to roost in the branches of coniferous and deciduous trees, the Hoary Bat is often referred to as a tree bat. Specific details on tree roosts in British Columbia are not available as only a few individuals have been found roosting in the province it seems to select sites that will conceal it from predators and yet also provide an open flight path for easy access to and from the roost. In Oregon the Hoary Bat prefers old Douglas-fir forests, presumably because of its tree-roosting habits. Although its usual day roosts are in the branches of trees, the Hoary Bat has been found roosting in tree cavities in British Columbia. The Hoary Bat rarely roosts in caves or buildings. In summer, males are solitary and females roost with their young. Female Hoary Bats do not congregate in maternity colonies. Because their tree roosts are more exposed than the maternity roosts of other bats, females will stay with their undeveloped young for longer periods to keep them warm. Family groups will use the same roost for more than a month. Hoary Bats emerge about 30 minutes after sunset to feed and continue to forage throughout the night. The Hoary Bat is often attracted to insect concentrations at lights outside buildings; permanent outdoor lights may even be responsible for its presence at some locations in the province. In well-lit areas where insect prey is concentrated, a Hoary Bat will establish a feeding area and chase away other bats. Loud chirping calls audible to the human ear are often emitted during these chases. Besides their role in communication, these calls may also provide some echolocation information. The Hoary Bat has the broadest distribution of any North American bat ranging from South America to northern Canada. It has managed to colonize a number of isolated islands including the Hawaiian Islands. In British Columbia, it is found on Vancouver Island, the coastal mainland north to Garibaldi Provincial Park, and the southern interior north to the Williams Lake region. In some regions of North America the sexes appear to occupy separate summer ranges. Based on the few available records the sexes appear to overlap extensively in British Columbia. The Hoary Bat is associated with a variety of forested and grassland habitats in the province. It ranges in elevation from sea level to 1250 metres. 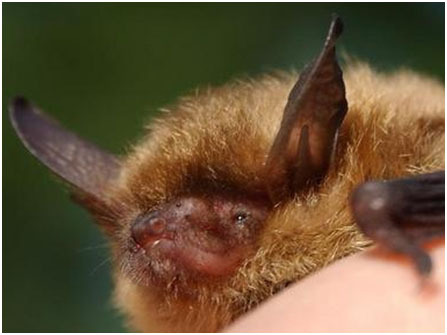 Keen’s Long-eared Myotis is a medium-sized Myotis species that measures between 63-94 mm total length and weighs between 4-6 g, They have dark, glossy fur and darker indistinct spots on the back of the shoulder; the underside is paler. Its long ears extend beyond the nose when pressed forward; the tragus is long, narrow and pointed. The ears and wing membranes are dark brown but not black. The outside edge of the tail membrane has a fringe of tiny hairs that can be seen with a hand lens. The calcar has an indistinct keel. The skull has a relatively steep forehead. Little information is known about Keen’s Long-eared Myotis however, it likely uses tree cavities, rock crevices and small caves as roosting sites. Until recently, the only known maternity colony of Keen’s Long-eared Myotis was on Hot Spring Island in Haida Gwaii. This colony is the only one studied in detail. Most of the natural history data for this species comes from this population. The maternity colony contains about 40 female Keen’s Long-eared Myotis, which roost under rocks heated by a natural hot spring. Temperatures at the roost entrance in summer range from 22°C to 27°C, whereas the ambient temperature varies from 11°C to 18°C because of these warm temperatures, the colony is quite humid throughout the year. The roost is situated below the high tide line and it is often submerged for several hours at high tide. During these periods of high tides the roost is abandoned. On Hot Spring Island, Keen’s Long-eared Myotis forages over hot spring pools and clearings above salal. Recently another maternity colony was found at Knoll Hill near Tahsis, Vancouver Island. Although the exact location of the colony was not found, it was identified by the presence of a reproductive female found in the area and identified as a Keen’s Long-eared Myotis using dna samples. The only known hibernacula are on northern Vancouver Island where Keen’s Long-eared Myotis have been found in 8 caves from 3 separate areas. 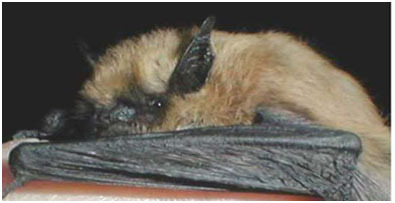 Keen’s Long-eared Myotis is the only North American bat restricted to the Pacific coastal region. The few locality records available suggest that its range extends from the Olympic Peninsula in Washington to southeastern Alaska. In British Columbia, it is found on the coastal mainland as far north as the Stikine River, on the Queen Charlotte Islands and on Vancouver Island. 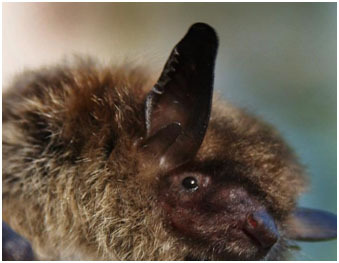 The distributional pattern suggests that Keen’s Long-eared Myotis is associated with coast forest habitats. 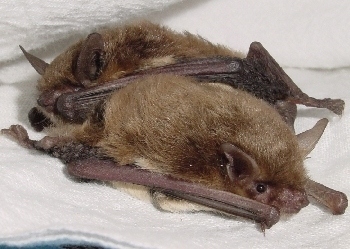 The Little Brown Myotis is a medium-size Myotis species that measures between 70-108 mm and weighs between 6-10 g. Its fur colour is extremely variable: the fur on its back ranges from yellow or olive to blackish. The fur on its underside is lighter, varying from light brown to tan. Its dorsal fur is long and glossy. The wing membranes and ears are dark brown. The ears reach the nostrils when pushed forward; the tragus is blunt and about half the ear length. The calcar is not keeled. The skull is typical of most Myotis species; the forehead has a gradual slope. Summer roosts are in buildings and other man-made structures, tree cavities, rock crevices, caves and under the bark of trees. In summer the sexes live separately. Females congregate in maternity colonies that may contain hundreds or even thousands of individuals. Males rarely occupy maternity colonies. In summer they can be found roosting alone or in small colonies usually in sites that are cooler than the nurseries. The Little Brown Myotis hibernates in caves and abandoned mines; it does not appear to hibernate in buildings. The Little Brown Myotis selects areas in the hibernaculum where there is high humidity (70-95%) and the temperature is above freezing (1-5°C). It may hibernate alone or in clusters. The Little Brown Myotis emerges at dusk to feed. It is an opportunistic hunter that eats a great variety of insect prey. After an initial feeding period of 15 to 20 minutes, individuals occupy temporary night roosts near the day retreat. Night roosts are used most often when temperatures are cool (below 15°C) a protected night roost may help the Little Brown Myotis remain active so that it can digest its meal faster. A widespread species, the Little Brown Myotis inhabits most of North America as far north as the tree-line. In British Columbia it is found throughout the entire mainland and on several islands, including Vancouver Island and the Queen Charlotte Islands. In British Columbia this bat exploits a wide range of habitats, from arid grassland and Ponderosa Pine forest to humid coastal forest and northern boreal forest. 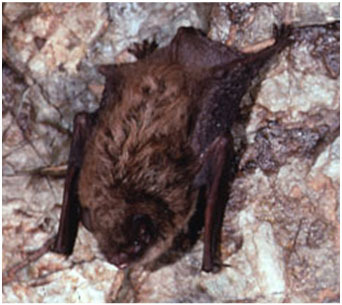 The Little Brown Myotis has the greatest range in elevation, ranging from sea level to 2288 m.
The Long-legged Myotis is one of the largest Myotis species in British Columbia measuring between 83-105 mm in total length and weighing between 5-10 g. Its fur colour varies from reddish brown to nearly black. The hair on its belly extends to the undersides of the wing membranes as far as the knees and elbows. The ears are rounded and barely reach the nose when pushed forward; the tragus is long and narrow. A prominent keel is present on the calcar. The skull is characterized by a relatively broad interorbital region and a steep forehead with a highly elevated brain-case. In the western United States this bat uses buildings, crevices in rock cliffs, fissures in the ground and the bark of trees for summer day roosts and maternity colonies. Only two maternity colonies have been found in British Columbia. One was a small colony in the attic of a house on Vancouver Island; the other was a large colony of some 300 individuals that was situated in an old barn near Williams Lake. Caves and abandoned mine tunnels are exploited for night roosts. The Long-legged Myotis emerges around dusk and remains active most of the night; even on cool nights as it is relatively tolerant of cold temperatures. This bat is an opportunistic hunter that takes aerial prey over water, forest clearings, among trees and above the forest canopy. The Long-legged Myotis inhabits western North America from Mexico to southeastern Alaska and western Canada. In coastal British Columbia, it is found on Vancouver Island and the coastal mainland around Vancouver. In the interior, there are records as far north as the Kispiox Valley and Atlin; the eastern limits of the British Columbia range are Cranbrook and Mount Revelstoke National Park. In British Columbia, the Long-legged Myotis inhabits arid range lands of the interior and humid coastal and montane forests. It ranges from sea level on the coast to 1037 m elevation in Mount Revelstoke National Park. The Silver-haired Bat measures from 90-117 mm in length and weighs between 6-12 g. It has a distinctive appearance with fur that is dark brown or black with scattered silver-white-tipped hairs giving it a lightly-frosted appearance. IOn the underside, the frosted hairs are concentrated in the belly. The ear is short and round with a short, blunt tragus. The ear and wing membranes are black. The dorsal surface of the tail membrane is lightly furred. The calcar lacks a keel. The skull has a blunt rostrum and is flat in profile. This species is generally regarded as a tree bat, although there is limited information on its summer roosting habits. Individuals have been found under the bark of trees and in crevices in tree trunks, abandoned woodpecker holes and bird nests. Trees appear to be the most important hibernation sites in the province: Silver-haired Bats have been found hibernating under the bark of Western Red-cedars in Vancouver; one was discovered in a Douglas-fir snag near Kamloops. Typically the Silver-haired Bat roosts alone or in small groups of two to six. Even when roosting in groups, individuals are rarely found in close contact. Most Canadian populations of the Silver-haired Bat are thought to be migratory overwintering in the United States however it can be found in British Columbia in all seasons. Changes in seasonal occurrence suggest that its range shifts northward in spring and southward in winter. This species emerges about 30 minutes after sunset to hunt in clearings around tree-top level and over water. There are two well-defined peaks in activity: the first between 10 pm and midnight, and the second an hour before dawn. Night-time activity is sharply curtailed when temperatures are below 8°C. The Silver-haired bat ranges widely in North America from northernmost Mexico to southern Canada and southeastern Alaska. In British Columbia it inhabits several coastal islands including Vancouver Island and the Queen Charlotte Islands, the coastal mainland north to Rivers Inlet, and the interior as far north as the Peace River and Spatsizi Plateau. In some parts of North America, males and breeding females appear to occupy separate summer ranges. This may not be the case in British Columbia because male and female distributions overlap extensively in all seasons. In British Columbia, the Silver-haired Bat is associated with forest and grassland habitats and ranges in elevation from sea level to 1220 metres. Townsend’s Big-eared Bat is a medium-size bat with enormous ears (about one half its body length) and two prominent, glandular swellings on its nose. It measures from 83-113 mm in length and weighs 6.0-13.5 g. Its long dorsal fur varies from pale brown to blackish-grey. The underside of the Townsend’s Big Bats is paler than the dorsal side of the body. The tragus is long (about one third the ear length) and pointed. The calcar lacks a keel. The skull is relatively narrow and the profile of the brain-case is curved. In the western United States, the Townsend’s Big-eared Bat uses caves, old mines and buildings as both summer day roosts and night roosts, with buildings being used more often in humid coastal areas. Females form colonies of a dozen to several hundred in dimly lit areas in buildings, caves or mines. This species is particularly sensitive to human disturbance and a number of biologists have noted that females will permanently abandon a traditional summer roost if disturbed. Males roost alone during summer, separate from females. In August, nursery colonies break up and individuals begin to migrate to caves and mines for hibernation. Townsend’s Big-eared Bat is relatively sedentary, moving 10 to 65 km between the summer roost and the winter hibernaculum. This is one of the few bats that has been consistently found hibernating in British Columbia. When in a state of deep torpor this bat hangs from a horizontal surface by its feet; its ears are curled back along the head in a shape resembling a ram’s horn. Folding the ears may reduce heat loss. Curiously, the tragus remains erect when the ears are folded-it has been suggested that the tragus acts as a heat sensor. The Townsend’s Big-eared Bat emerges an hour or so after dark to feed. It is an agile bat that is capable of flying at slow speeds. Food habits have not been studied in British Columbia however in the western United States; small moths (body length, 3-10 mm) form most of its diet. It also eats lacewings, dung beetles, flies and sawflies. This species feeds several times during the night so it is often near dawn before it returns to the day roost. The Townsend’s Big-eared Bat is found throughout the western United States; there are isolated populations on the southern Great Plains and in the Ozarks and Appalachians. In Canada, it is restricted to British Columbia. On the coast, it inhabits Vancouver Island, the Gulf Islands and the Vancouver area; in the interior, it has been found as far north as Williams Lake and east to Creston. In British Columbia this species is associated with a variety of habitats from coastal forests to arid grasslands of the interior. It ranges in elevation in the province is from sea level to 1070 m, although most occurrences are from low elevations. 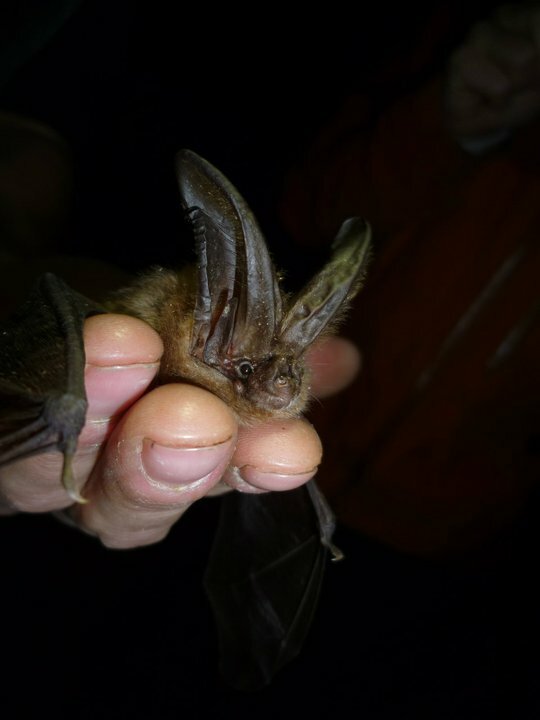 The Western Long-eared Myotis is a large Myotis species measuring between 74-103 mm in total and weighing between 4.2-8.6 g. Their ears are long, extending 5 mm or more beyond the nose when pushed forward. Its dorsal fur colour is extremely variable, ranging from yellowish brown to dark brown or nearly black. Blackish brown shoulder patches are usually evident but they can be indistinct on dark individuals. The outer edge of the tail membrane has a fringe of tiny hairs that can be seen with a hand lens. The ears and flight membranes are nearly black and usually contrast sharply with the paler fur. The tragus is long and slender with a small lobe at its base. The calcar lacks a distinct keel. The skull has a relatively broad interorbital area and a gradually sloping forehead. The skull of the Western Long-eared Myotis has a longer toothrow than that of Keen’s Long-eared Myotis and the Northern Long-eared Myotis: the distance from the last upper premolar to the last upper molar is greater than 4.2 mm. In summer the Western Long-eared Myotis uses buildings or under the bark of trees as day roosts; there are also a few records of this species roosting in caves, sink holes and fissures in cliffs. Maternity colonies, usually located in buildings, are generally small (5 to 30 individuals) and may contain a few adult males. Caves and mines are used as temporary night roosts.There are no winter records for the province; in fact, this bat’s winter biology is poorly documented throughout its range. In the western United States, a few individuals have been found hibernating in caves and mines and there is a December record from coastal Oregon of an individual that was found in a garage. 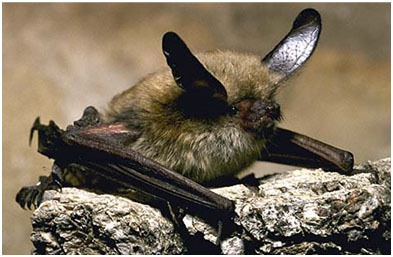 Western Long-eared Myotis typically emerge 10 to 40 minutes after dark to feed. It is quite flexible in its feeding behaviour, eating airborne insects as well as gleaning insects from vegetation or off the ground.It is known to prey mainly on moths, as well as beetles, flies and spiders. Its quiet, short-duration, high-pitched echolocation calls are an adaptation for hunting in habitats with heavy vegetation. Furthermore, these calls are not readily detected by most moths. When closing in for an attack, the Western Long-eared Myotis often stops calling and listens for sounds produced by its prey. 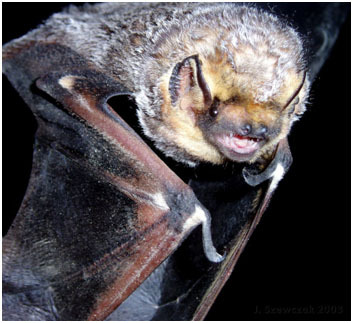 Moths may be especially vulnerable to predation by the Western Long-eared Myotis because their fluttering is audible. This is a western bat that ranges from Baja California through the western United States to Saskatchewan, Alberta and British Columbia, where it occupies the entire mainland as far north as the Bella Coola Valley on the coast and the Prince George region in the interior. It also inhabits Vancouver Island but appears to be absent from the Queen Charlotte Islands. This species is found in a wide range of habitats in the province, from arid grasslands and ponderosa pine forests to humid coastal and montane forests. In British Columbia it ranges in elevation from sea level on the coast to 1220 m in the Cascades (Manning Provincial Park) and Rocky Mountains (Kootenay National Park). This is one of the few bats found consistently at high elevations in western Canada. In the Kananaskis region of the Alberta Rockies, summer populations consisting of both sexes live at 1350 to 2050 m.
The Yuma Myotis is a medium-size Myotis species measuring 60-100 mm and weighing between 4-9 g. Its dorsal fur varies from pale brown to nearly black; the fur on its underside is paler. The wing membranes and ears are dark brown. The ears reach the nostrils when pushed forward; the tragus is blunt and about half the length of the ear. The calcar is not keeled. The typical Myotis skull has a steeply sloped forehead. Its summer day roosts are usually in buildings and other man-made structures in close proximity to water. Maternity colonies in buildings can be enormous with one of the largest known colonies of bats in British Columbia comprises 1500 to 2000 adult female Yuma Myotis. The Yuma Myotis also roosts in caves and trees, but colonies in these situations are usually small. Males roost separately from females, either alone or in small groups. Various man-made structures such as house porches, abandoned cabins and bridges can serve as night roosts. Around dusk the Yuma Myotis emerges from its day roost to hunt over lakes, rivers and streams. Although food habits have not been studied in most parts of the province, aquatic insects are probably the major prey throughout its range given this species tendency to hunt over water. An efficient hunter, the Yuma Myotis can fill its stomach in 10 to 15 minutes on a productive summer night. After feeding, it retreats to a temporary night roost near the feeding area. The Yuma Myotis is found across western North America from Mexico to southern British Columbia, where it inhabits several coastal islands including Vancouver Island, the coastal mainland as far north as Kimsquit, and the interior north to the Williams Lake region and east to Nelson. The Yuma Myotis ranges in elevation from sea level to 730 m in the province, where it inhabits coastal forests, ponderosa pine, interior Douglas-fir forests, and arid grasslands.